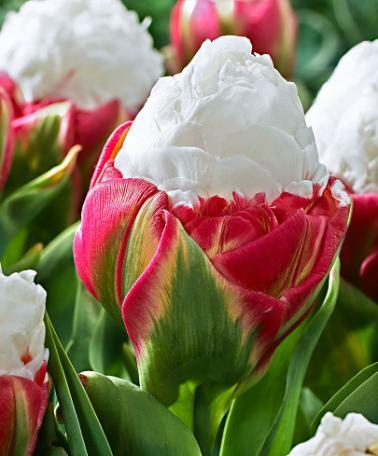 This review is for Tulipa ‘Ice Cream’ from Spalding Plant & Blub Co.
Tulips are bulbs and this new variety is a late flowering double approximately 25cm (10ins) tall which, when in full bloom, looks like an ice cream! The outer petals are formed around closely formed inner white petals which look like ice cream within a dark pink cone. The flowers also last well in a vase so will make a wonderful display for your home during spring time. This variety will do well either in the ground or in a pot, wherever you decide to plant them, place them in a hole which is at least three times the depth of the bulb. They should be planted pointy end up about 10cm (4ins) apart or 7cm (3ins) in a pot, into a well-drained, gritty compost. 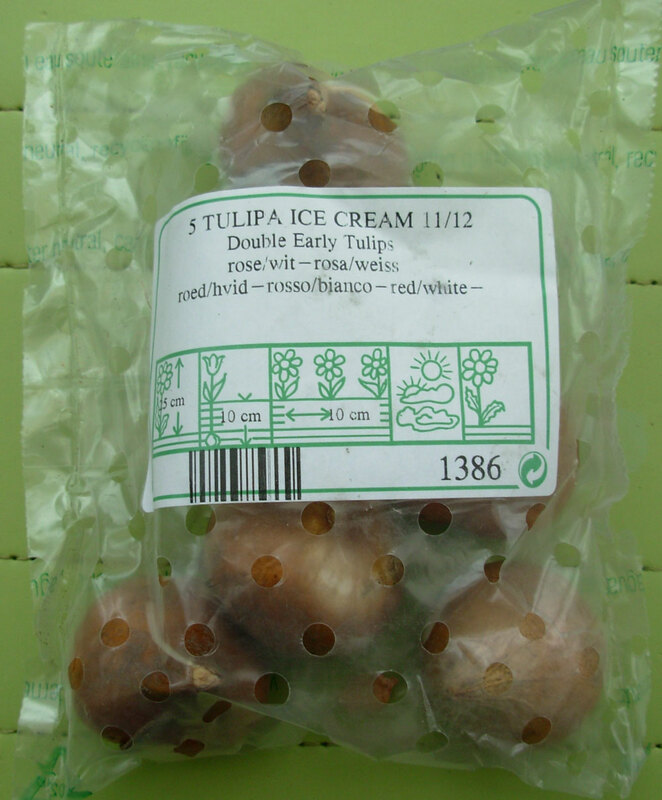 As with most Tulips, Ice Cream will flower during April and May; allow the foliage to die down then either lift them and store for next year or give them a good mulch to protect them through the coming winter. Tulipa ‘Ice Cream’ is at its best in the first season and may not do as well in subsequent years so it would be wise to replace or add to your display each year. The pack of 5 bulbs arrived in a breathable bag, well packed in a cardboard box. In the box was a care leaflet and tips on how to deal with your bulbs on arrival. The label on the front of the bag told me that the flowers will grow to 25cm, they should be planted 10cm deep and spaced 10cm apart. All very useful information. On opening the bag I found five good quality, firm bulbs which is exactly what I was hoping for. The weather today is too wet to plant out the bulbs and there is no rush to get them in the ground so I will keep them in a cool place until I am ready to plant them up. As I only have five of these lovely bulbs I will be planting them into a decorative pot which I will be able to place where I can appreciate them most once they are in flower. 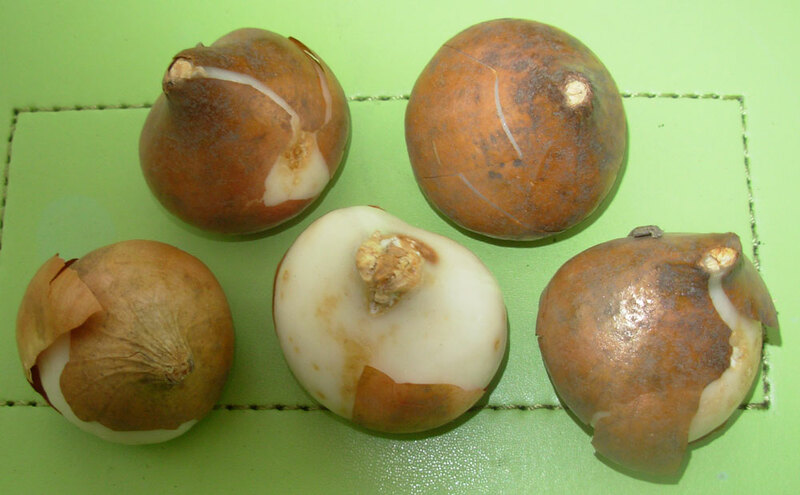 The first part of this review was written on 24th September 2012, bookmark this page and return soon to follow how I planted the bulbs and how they eventually flower.